Learn how to transform your fundraising program in one day and raise more money by adopting donor-centred practices from some of the world’s leading practitioners and thinkers. Placing the donor first, long before they even become a donor may be a disruptive concept for some organisations but, if you can shift the paradigm, you will raise significantly more money for your mission. Featuring four internationally-renowned speakers, the Extraordinary Donor Journey is a one-day curated summit and workshop for fundraisers and sector leaders to explore a timely topic, in-depth, and for practical application. The summit will focus on the only person who truly matters in fundraising – the donor. In the face of pervasive technology, greater competition and increased regulations around privacy and donor access across the globe, there’s never been a more important time to be #Donor-centred. In conjunction with Global Philanthropic’s #TalkingPhilanthropy series, this one-day summit and workshop will inspire you with new thinking and arm you with the skills and practices to transform your organisation into a donor-centred fundraising success story. Simone Joyaux So just what is an Extraordinary Donor Journey? Please note, this list of speakers and topics was correct at time of publication. The organisers reserve the right to alter the program without notice. Simone’s session focuses on ‘the right stuff’ to produce an incredible donor journey. Things like: curious research findings to shock your boss and board; loyalty as the Holy Grail of any business; the triumph of emotions; extraordinary experiences; together we’ll play the customer-centred game; maybe we’ll play complain and whine, too – and who knows what else? We’ll talk about how to engage your board members in the work (and joy!) of sharing extraordinary experiences … what extraordinary experiences might work best for your organisation … and how to build these into your fundraising plan. Through her consultancy, Joyaux Associates, Simone has worked with literally hundreds of organisations over 30 years. She has worked with all-volunteer organisations with tiny budgets through to huge organisations with hundreds of staff and multi-million-dollar budgets. Simone is an expert in fundraising, governance/boards, strategic planning, and she often acts as a coach and mentor for clients. She’s written three books including Keep Your Donors, Strategic Fund Development (now in its third edition) and Firing Lousy Board Members and contributed to many others. Simone speaks worldwide at some of the best-known fundraising and nonprofit conferences and she also teaches in the master’s program in Philanthropy and Development at St Mary’s University of Minnesota. 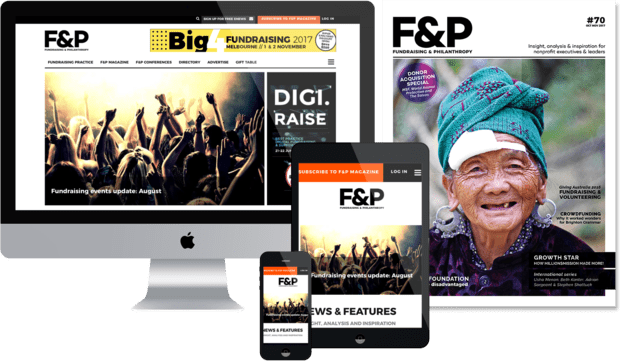 Fundraising copy that struggles, describes the astonishing work of the nonprofit, backing it up with strong statistics and arguing the case for support. Nothing is more boring to those outside the organisation. It does not satisfy the reasons donors give … so they don’t. More recently we hear exhortations to ‘tell stories’, but these are simplistic solutions and very often fail to produce response. In this session, Stephen will reveal the secret techniques agencies use to produce winning fundraising copy. Fundraisers who are seeking a more committed response from supporters must first connect with them. That requires a clear connection device – in agency terms, a concept. You’ll learn how to find these ‘big ideas’ and then how to translate them into copy that is irresistible. A session sprinkled liberally with exercises, check lists and new ways of thinking to transform the success of your appeals, and fight the chaos of inaction. Stephen Pidgeon works with nonprofit organisations to develop strategy and creative that raises millions. As a fundraising executive and consultant for 35 years he has provided creative and strategic support to nonprofits, universities and arts organisations across the world and in particular: UK, Norway, Canada, USA, Ireland, Denmark and New Zealand. Stephen is a visiting Professor of Direct Response Fundraising at the Hartsook Centre for Sustainable Philanthropy, Plymouth University. He recently received the Institute of Fundraising’s (UK) Lifetime Contribution Award, and his first book, How to Love Your Donors … to Death, was published in 2015. He recently contributed to the latest edition of the definitive text on legacy marketing, Legacy and In-Memory Fundraising. He is widely regarded as one of the best fundraising speakers in the world. He has spoken at the prestigious International Fundraising Congress (Netherlands) for twenty-five years, and he regularly appears at the Association of Fundraising Professionals (USA) and Institute of Fundraising (UK) annual conferences. His passion is Minor Donor Fundraising. It’s a term he coined for the fundraising that brings in small gifts from many people. Minor Donors, he argues, have the potential, when they die, to make gifts that eclipse all but the biggest Major Donor gifts. So they should be treated with the special importance this potential earns them. This is a workshop of transformation and disruptive thinking, and it will be impossible for you to approach major gift cultivation and solicitation the same way again. Guy will reinforce donor centric practices of balancing donor interests against organisational priorities. He will discuss transparency; cultivation and solicitation (asks); and metrics to measure performance and outcome. Specific key concepts covered will include: fundraising’s fundamental truth; donor motivations and barriers; emotion vs. reason; money drives mission; the importance of ‘moves management’; and designing a cultivation plan amongst many others. You will leave this workshop understanding the top areas to focus and prioritise your energy and resources on for major donor-centred fundraising. Since 1980 Guy has successfully led numerous fundraising campaigns and major gifts programs, and he is widely regarded as one of the world’s leading experts on major gifts fundraising. Guy is the President and Chief Executive Officer of Global Philanthropic Canada. He is a sought-after speaker and trainer and has presented keynote and workshop sessions at numerous international conferences in Canada, the United States, Europe, South Africa, and Australasia. His masterclass workshop on major gifts at the 2017 International Fundraising Congress in The Netherlands received the highest attendee evaluation scores. Guy is editor and author of the recently released best-selling book, Excellence in Fundraising in Canada; the professional assessment book The Fund Development Audit and numerous articles and research papers. He is currently an Adjunct Professor for the Masters in Fundraising program at the University of Bologna, Italy, and a member of the Program Advisory Committee for Carleton University’s Masters’ Program in Philanthropy and Nonprofit Leadership. Guy has been recognised by two Canadian chapters (Calgary and Edmonton) of the Association of Fundraising Professionals, as the annual Outstanding Fundraising Professional. Bernard’s workshop will focus on what leading edge science in neurology and behavioural economics can tell us about the mental journey our donors make to take decisions about who to support. In a challenging session he’ll show that much of what is regarded as fundraising ‘best practice’ is plain wrong and share new insights that will help you genuinely understand donors and help them engage with your cause. We’ll roam across channels – from digital to face-to-face and from regular givers to bequestors. The session will combine powerful frameworks and case studies from Bernard’s work globally with organisations as diverse as UNICEF and MSF as well as museums, universities and social change campaigns. Most important you’ll leave with a practical plan you can put in place – and take action on. Bernard is an internationally regarded expert in fundraising, strategic thinking, change leadership, innovation and organisational transformation. In the last five years Bernard has raised funds to: renovate France’s most iconic monument; build a museum in Patagonia to house the largest dinosaur that ever lived and created the case to safeguard the last 750 gorillas in the Rwandan rainforest. In between, with his talented team of colleagues, he’s created multi-billion-dollar global strategies for the International Federation of Red Cross and Red Crescent, MSF, and UNICEF International. On the rare occasions he’s in the office he’s a Director of the Management Centre (=mc), a management consultancy working worldwide for ethical organisations. Over his 25-year career specialising in the nonprofit sector he has written four award-winning books on a range of topics including innovation, influence and strategy. Global Fundraising, which won the Skystone Award in the USA, is the first fundraising book to be translated into Chinese and was published by University of Shanghai Academic Press in 2018. His 5th book, Change for Good – Behavioural Economics for a Better World, was published in June 2018.